THE Autumn Sun, rated the heir apparent to Winx as the nation's best racehorse, has already achieved what only two other horses have managed in the last two decades - but the best is yet to come. 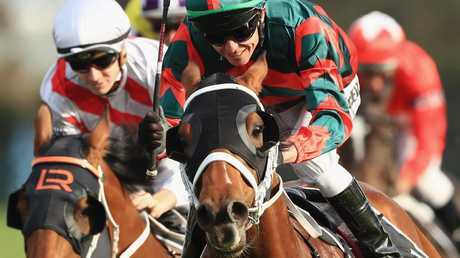 This is the opinion of champion jockey Kerrin McEvoy who is eager to reunite with the outstanding three-year-old colt in the Group 2 Hobartville Stakes (1400m) at Rosehill Gardens on Saturday. "I know The Autumn Sun has shown he is a stellar colt already but this preparation could be the best part of his three-year-old season,'' McEvoy said. The Autumn Sun's Golden Rose-Caulfield Guineas double, which ended the colt's spring campaign last year, improved his race record to three Group 1 wins in only six starts, a feat only matched by his sire, Redoute's Choice and Pierro in the last 20 years. The Autumn Sun has also won the JJ Atkins Stakes at the top level last year. 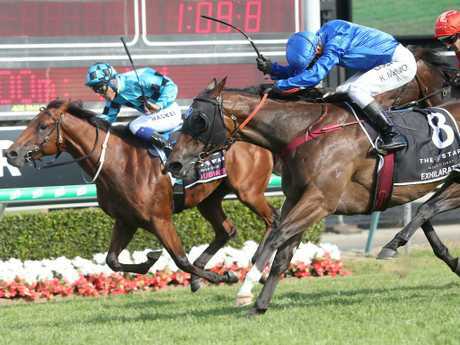 Redoute's Choice won the Blue Diamond Stakes, Manikato Stakes and Caulfield Guineas in 1999, while Pierro won the Sydney two-year-old triple crown, Golden Slipper, ATC Sires Produce Stakes and Champagne Stakes during his unbeaten juvenile season in 2012. The Autumn Sun's race record and impeccable bloodlines is the reason Arrowfield Stud supremo John Messara moved last spring to buy a half share in the colt he bred. With super sire Redoute's Choice's stud career in its twilight phase - the 22-year-old stallion will be restricted to only about 40 mares next spring breeding season - Messara has earmarked The Autumn Sun as his replacement. 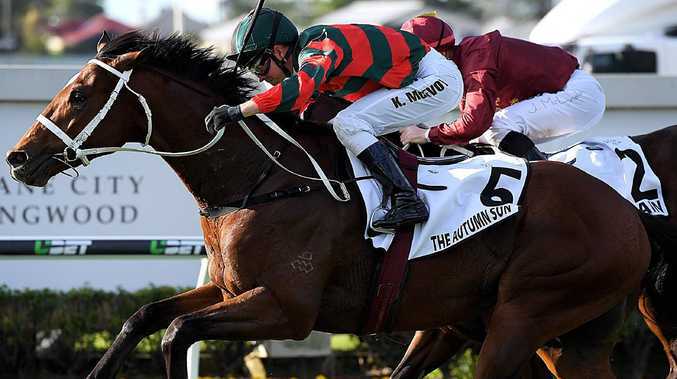 The Autumn Sun, trained by Chris Waller, is arguably the most expensive racehorse in training and every start will be heavily scrutinised this campaign. The glamour colt's reputation is such he has been installed as the $1.55 favourite by Ladbrokes for the Hobartville despite some mixed reviews after his recent barrier trial effort when fourth to Zousain, I Am Serious and Spright in a 1000m heat two weeks ago. McEvoy defended The Autumn Sun's trial effort and maintained the colt is doing everything right ahead of his Hobartville Stakes comeback. McEvoy described The Autumn Sun's track gallops since his latest trial as "really pleasing" which augurs well for a winning return to racing on Saturday. The Autumn Sun's race preparation has not been determined beyond the Group 1 $1 million Randwick Guineas (1600m) on March 9 but McEvoy said the colt's versatility provides Waller with plenty of race options. "He has shown a lot of speed up to 1600m and who knows we might be able to see him over a bit further eventually,'' McEvoy said. The Autumn Sun is clearly the highlight from an excellent book of eight rides for McEvoy on Saturday. He is also partnering favourites Seaway ($1.85) in the Schweppes Handicap (1500m) and So Taken ($4.80) in the Spark Of Life Handicap (1100m). 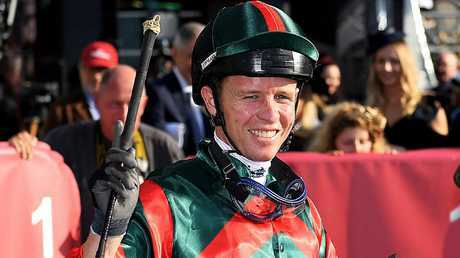 McEvoy rides unbeaten youngster McLaren ($5) in the Group 2 $250,000 Silver Slipper Stakes (1100m), Savatiano ($8) in the Group 2 $200,000 Millie Fox Stakes (1300m) and High Bridge in the Listed $140,000 Parramatta Cup (1900m). The Golden Slipper is only a month away and McEvoy is still to determine his ride in the world's richest two-year-old race. McLaren is in the mix along with the likes of Magic Millions winner Exhilarates and emerging Tenley. McEvoy didn't ride McLaren when the colt won the Canonbury Stakes on debut but he has been on the youngster's back at trackwork since and has been impressed with the Peter and Paul Snowden-trained youngster. "We are getting to the nitty gritty of Golden Slipper calculations now and we will know a lot more after the Silver Slipper and Blue Diamond (tomorrow),'' McEvoy said. "Peter said McLaren has come on since his first start and his work on Tuesday morning was very good. McEvoy has ridden former English stayer High Bridge twice for dominant wins at Canterbury and Warwick Farm last spring and regains the mount when the gelding resumes in the Parramatta Cup.